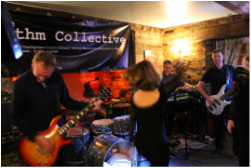 "... as an accomplished covers band, The Rhythm Collective always manage to make their song choices interesting and fresh to listen to, often putting a new spin on an old classic ..."
"Thank you for a fab night. You are a great band. Love your music!" "I LOVE that The Rhythm Collective aren't your 'average rock band', since they tackle songs from a wide variety of genres, using guitar & keyboards creatively to replicate a wide variety of instruments from harmonica to brass section, which always makes for an interesting song mix & sound." "OMG you rocked! Best ever gig. Thank you xxxx"
"... a fine bunch of crazy's!." "... the whole gig displayed great chemistry between the band members, good vocal harmonies and some fantastic guitar solos making The Rhythm Collective well worth going to see." 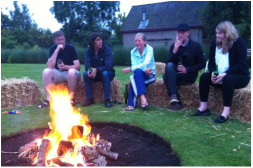 The Rhythm Collective are also on Lemonrock and Facebook.